Having taken several classes centered on accountability for mass atrocity crimes, I’ve run across a lot of common questions. One question is the notion that we all know that killing is bad – mass killing exponentially so – so what effect does making it illegal or prosecuting it really have? A couple of years ago I ran across, of all things, Secretary of Transportation Ray LaHood speaking on CSPAN (I know, right?). I have no idea what the circumstances were, but he detailed that in the past people rarely used seat belts despite knowing that they protected them. After states began to make it illegal to drive without wearing seat belts, more and more people wear them now. According to some surveys, many wear them not to be in line with the law but because they are safe and that is what you do when you are in a car. In a very weird connection and long stretch, you could say the same about atrocities – after a while the fact that one faces prosecution could change the mindset about actions one is willing to take. It’s weird, but it’s a connection. When society speaks up about what is wrong, fewer people are willing to commit that act. 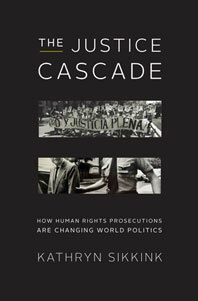 Enter Kathryn Sikkink, professor at the University of Minnesota and author of The Justice Cascade . I’m currently halfway through the book and it makes a strong case for human rights prosecutions. The book gives an intricate history of human rights prosecutions in Greece, Portugal, and Argentina. Sikkink also works to debunk the notion that the specter of prosecutions is dangerous for transitional democracies, another concern I’ve heard in academia and in advocacy. But the heart of the book is that Sikkink looks at the diffusion of justice and accountability between countries. The first change in the international justice system was to make individuals accountable instead of just states – and this has definitely grown as more perpetrators are indicted and prosecuted for their actions. She also notes the increase in international, foreign, and domestic human rights prosecutions across the board by using a database. The database counts all “processes of prosecution” regardless of verdict and uses the State Department’s human rights reports as its source. According to her research, Sikkink found that Latin America, which has had the most human rights prosecutions of any region, is also the leader in successful democratic transitions. Most of the allegations that trials could lead to a renewal of conflict seem rooted in an attempted coup in Argentina when prosecutions expanded to include more suspects. The coup failed and the trials continued and even spread across the region, fostering democracy. Somehow, the threat has lived on in policy circles. She also found that more prosecutions foster better human rights practices, and that if four or more countries in one region have prosecutions, the countries nearby could benefit even without having prosecutions – accountability and deterrence cross borders. The question is if that deterrence only works in a regional context or if it can lead to a global deterrence through international prosecutions. I’m only partway through the book so far, but Sikkink makes a pretty good case for how prosecutions can impact societies for the better.